The gardens are spectacular this year with not a lot of maintenance. They are now in their 5th year and so "English style" that the weeds don't have a chance to grow except at the edges. 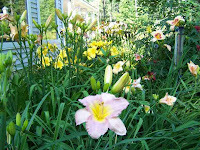 Our first plantings were from White Flower Farm, a mail order nursery in CT.
http://www.whiteflowerfarm.com/ . 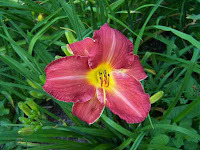 We bought a mix of colored lilies, not knowing what we would get. 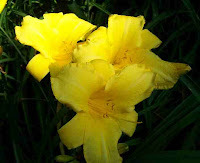 Each year they suprise us with the brilliance of their colors and how much they have spread. Bee Balm is one of my favorite garden plants. Yes it gets powdery mildew but the color and smell is just devine and worth putting up with the mildew. 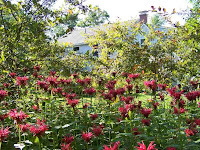 This photo is of one patch of bee balm with the back of the house in the background. Everything has grown well this year as we have had lots of rain and hotter days than usual. The iris were tall and colorful, the deck plants growing well. Always a trial to finally pull them out of the deck pots when fall comes and the frost kills it all. 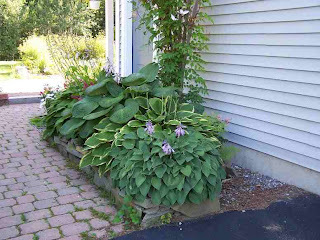 Your Yard is spectacular! Now I see what all the sore back was about. Lots of work and lots of lovely pictures. It is lovely to look at. You take fabulous pictures. However do you do that? Gee, only 6 more days until AUG 1st? Your garden is wonderful. 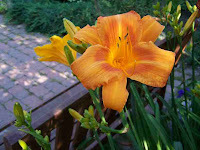 I love lilies, day lilies or oriental. The bee baum is lovely. 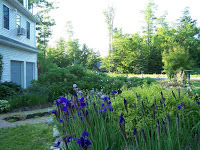 Your gardens make me long to come visit Maine again. We used to come annually to the Tunk Lake area and hike in the mountains. Maybe next summer.